What do credit cards have to do with abortion and Roe v. Wade? Nothing, really. Today marks the one year anniversary of the Whole Women’s Health v. Hellerstedt decision. The U.S. Supreme Court struck down a law in Texas that would have required abortion clinics to meet the same standards as ambulatory surgical centers. Many abortion supporters have seen this as one of their biggest wins in a sea of defeats over decades. While abortion supporters hail this as a victory for women, in reality this ruling showed that the court was willing to abuse good judgement to further push for abortion-on-demand at the expense of women. Their judgment came at the cost of actual safety of women. There are countless complications that can arise during or after abortions. Some of them can be life threatening or other serious complications like hemorrhaging, severe pain, seizures or a perforated uterus. Many abortion clinics are not well equipped to handle emergency situations, many can’t even fit a gurney through their hallways if an ambulance arrived to handle an emergency. The abortion industry is notorious for allowing clinics to operate for years under filthy and squalid conditions. To celebrate the anniversary Refinery 29—a well-known progressive blog site that caters to millenials—posted a long article titled, "This is How Abortion Ends in America." This article outwardly attacks the prolife movement because we are slowly chiseling away at the abortion-on-demand standard that was created by Roe v. Wade and Doe v. Bolton. They mention the recent executive orders that end funding to international population control organizations, taking away funding from Planned Parenthood, and putting more regulations on abortion clinics as a few of the advances that the prolife movement has made. The article even calls out Roe v. Wade for not going far enough. The author claims that Roe was only created to make sure that abortions were rare and safe. But when nearly a million abortions are done a year, is that something that is really rare? People might say they want abortions to be rare, however that's not the case. Already the United States stands with just China, North Korea, Vietnam, and Canada as having the most extreme pro-abortion laws on the planet. How much farther can we go? After-birth abortions? None of these arguments are new, but it does show that our recent successes and prolife elected officials (including President Donald Trump) are putting the pro-abortion supporters on the hot seat. With the momentum in our favor many pro-abortion groups are throwing anything they can against the wall, hopeful that something will stick—even if that means creating a false narrative. One of the article's ridiculous claims was that Roe helped push a long a more progressive agenda to allow women to apply for their own credit cards without their husbands approval. If you go actually go back and look at the Equal Credit Opportunity Act of 1974, it passed the U.S. House by a vote of 355-1 and the U.S. Senate on a voice vote (they didn't even bother to take a roll call). That doesn't look very contentious to us. According to the Guttmacher Institute 338 new abortion restrictions have been passed in the last six years, more than ever before. Though abortion supporters claim that this is the prolifers way of attacking the rights of women, it is simply the fact that legislators are listening their constituents. Recently Gallup put out a poll that showed that 54% of Americans want all or most abortions to be illegal. The poll found the abortion views of women and men don't really differ. Are half of women attacking themselves? Most prolife organizations are led and staffed by women. The idea that a bunch of women are running anti-women organizations is another false narrative to distract from the central question: what are the unborn? Articles like this show us that our hard work is paying off. Abortion advocates are squirming because they are beginning to believe they will ultimately lose the argument over whether or not the unborn child deserves recognition and protection. We have been fighting for 50 years to protect the unborn. They said back then prolifers would quickly melt away and abortion would become acceptable. The opposite has happened. Even though our hard work pay off, that does not mean it is time to slow down. The U.S. Supreme Court could be in play for the first time in decades. With several big cases coming up, it could take just one more justice to tip the balance in favor of the rule of law. The rule of law benefits prolifers because abortion just plainly isn't in the U.S. Constitution. With two justices over 80 and another at 78, this issue is on everybody’s radar. In Michigan, we have even more at stake if Roe v. Wade and Doe v. Bolton were to be over turned. We are one of just eight states that could recover our laws protecting the unborn once Roe is overturned. Reading ridiculous articles like this reminds us that we must keep our eyes on the prize and keep pushing forward. Together we will end abortion. 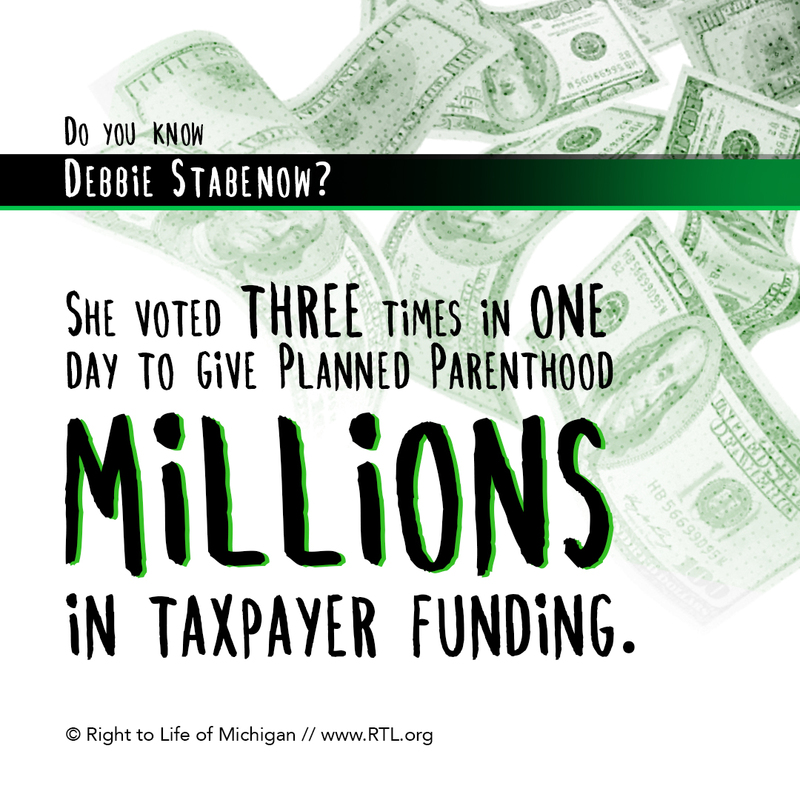 Senator Debbie Stabenow has a long record supporting taxpayer funding to Planned Parenthood, the nation's largest provider and promoter of abortions. A simple look at Planned Parenthood's annual reports shows how they leverage increasing taxpayer funding to expand their abortion services and cut other health services. Planned Parenthood currently receives more than $500 million annual taxpayer dollars, nearly half of their billion-dollar-plus budget. 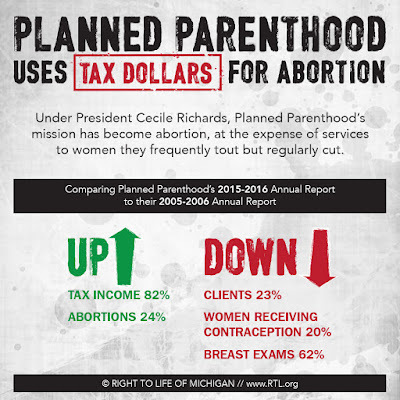 One day in particular, December 3, 2015, provides a clear summary of Senator Debbie Stabenow's position on Planned Parenthood and taxpayer funding of abortion. She voted three separate times to give the nation's largest abortion clinic chain millions in taxpayer dollars. On that day the U.S. Senate passed a budget reconciliation bill that would have repealed taxpayer subsidies of insurance plans that cover abortion through Obamacare and included a provision to block most of Planned Parenthood's federal tax funding. The bill passed by a vote of 52 to 47, with Senator Debbie Stabenow voting against it. The bill was later affirmed by the House but vetoed by President Barack Obama. An earlier vote that day was on an amendment offered by Sen. Susan Collins (R-Maine). The Collins Amendment would have removed the language to defund Planned Parenthood from the budget reconciliation bill. The Collins Amendment failed by a bipartisan vote of 48 to 52, with Senator Debbie Stabenow again voting in favor of Planned Parenthood. Senator Debbie Stabenow's other vote that day went beyond just stopping efforts to defund Planned Parenthood. Sen. Patty Murray (D-Wash.) offered an amendment to the budget reconciliation bill to authorize $1 billion in new funding that only organizations that provide elective abortions would be eligible for. Since Planned Parenthood is the only large-scale organization in the country that provides abortions they would have received the extra billion dollars. 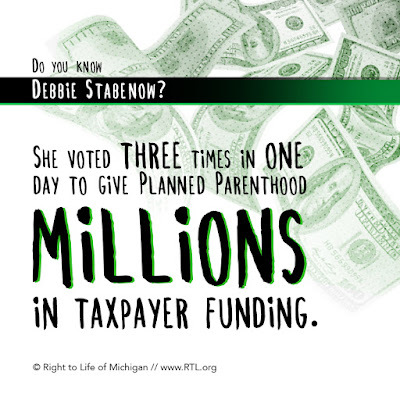 Planned Parenthood often argues the taxpayer dollars they receive only involve reimbursements for health services, but here Senator Debbie Stabenow was clearly voting in favor of using tax dollars to expand abortion by nearly doubling Planned Parenthood's budget. The amendment failed by a bipartisan vote of 46 to 54, with Senator Debbie Stabenow for the third time in one day voting to send tax dollars to support abortion at Planned Parenthood. This is the first in a series we'll be running throughout 2017 looking back at historically significant prolife moments in our state's history. The effort to legalize abortion in America began in earnest in 1959, when the influential legal group ALI (the American Law Institute) recommended legalizing abortion in the first draft of their model penal code. ALI makes recommendations for clarifying various laws, but in this case they sought to change the law. Colorado was the first state to legalize abortion in 1967. A similar effort in Michigan in 1967 was defeated, but several other states fell to concerted efforts by abortion advocates over the next few years. The first prolife advocates in many states were caught flat-footed by these attacks against the humanity of unborn children. To oppose this momentum the prolife movement began in earnest to organize themselves. In Michigan Kalamazoo Right to Life became the first local group to organize in 1970. Other independent groups around Michigan began to organize as well. The momentum in favor of abortion came to a screeching halt in 1971. Had the U.S. Supreme Court never waded into the issue of abortion, 1971 could likely have been the high water mark for abortion in the United States. Following successful defensive efforts in 1971, the prolife movement began moving to roll back legalized abortion in several states. They were aided by a shocked populace who didn't expect to see so many abortions, particularly in New York. There was a dawning appreciation that abortion was a Pandora's Box that ought not to have been opened. New York legalized abortion-on-demand up to 24 weeks of pregnancy in 1970, but prolifers were successful in passing legislation to repeal the law through New York's state legislature by 1972. The only thing standing in their way was a veto from the hardened Republican New York Governor Nelson Rockefeller. Rockefeller was a high-profile politician who attempted several runs at the presidency and ultimately served as President Gerald Ford's vice president. The Rockefeller family has long been a driving force behind abortion and population control programs globally. Their family's Population Council organization is responsible for bringing the RU-486 abortion pill to the United States. With the stunning reversal in New York abortion supporters needed some positive momentum. They next looked to Michigan as a large target to breathe new life into their movement. By 1972 several abortion legalization proposals had failed in the Michigan legislature. Abortion supporters decided they needed to take their case to the public through a ballot referendum. The only other public vote on abortion had been in Washington state in 1970, where they succeeded in legalizing abortion. 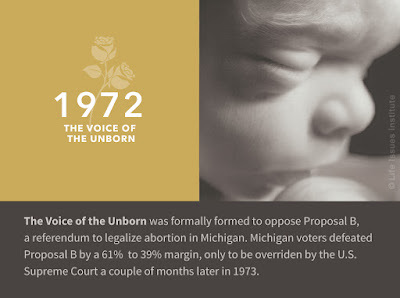 Proposal B of 1972 would have repealed Michigan's prolife law protecting the unborn to allow abortions during the first 20 weeks of pregnancy. The people voted on the ballot proposal on November 7, 1972, and it failed with 1,270,416 "yes" votes and 1,938,265 "no" votes. Instead of putting the abortion movement back on offense a super-majority of Michigan voters issued them a strong rebuke. What made the difference? 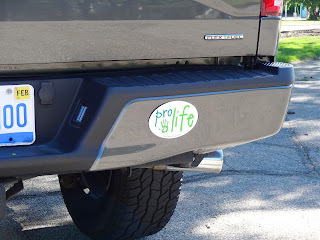 Local grassroots prolife volunteers. Many groups that would later become affiliates of our state organization banded together under a common banner, the Voice of the Unborn. These local grassroots volunteers outworked a very nationally-minded abortion movement with a simple message about the value of all human life. The thousands of individuals involved in the Voice of the Unborn didn't know that their victory was predestined for defeat as seven members of the U.S. Supreme Court were in the process of writing their decisions in Roe v. Wade in Doe v. Bolton. With the abortion movement flailing for help, unelected pro-abortion judges took it upon themselves to do what their allies could not through the democratic process. The Voice of the Unborn's victory was not in vain, however. The Voice of the Unborn would eventually become Right to Life of Michigan and we have continued using the same locally-focused model to achieve victories to advance legal protections for unborn children. It's the same organizational model that will allow local volunteers from places most Americans have never heard of to overcome the many influential institutions with cushy metropolitan offices that continue to stand in the way of restoring legal protection to all innocent unborn children. Visit our blog in July for our next notable prolife moment in Michigan history in 1979. Bob’s experience in the emergency room was common to anyone who has faced a life-threatening blood clot. The emergency room staff focused on stabilizing Bob and succeeded in their mission. He was then transferred to the intensive care unit, where he would recover as they worked to dissolve the clot in his lungs. Genevieve said her father was only 76 years old and in decent health given his chronic condition. He was enjoying the twilight of his life with his family. He had lived more than year after his previous doctor said he could “go” at any time. Bob had not left yet, and Genevieve said her father was not quite ready to go. Instead of being allowed to heal—to spend his remaining days at home with family—the very coherent and aware Bob became the nearly helpless subject of efforts to hasten his death. The wishes of the hospital quickly diverged from those of the patient. 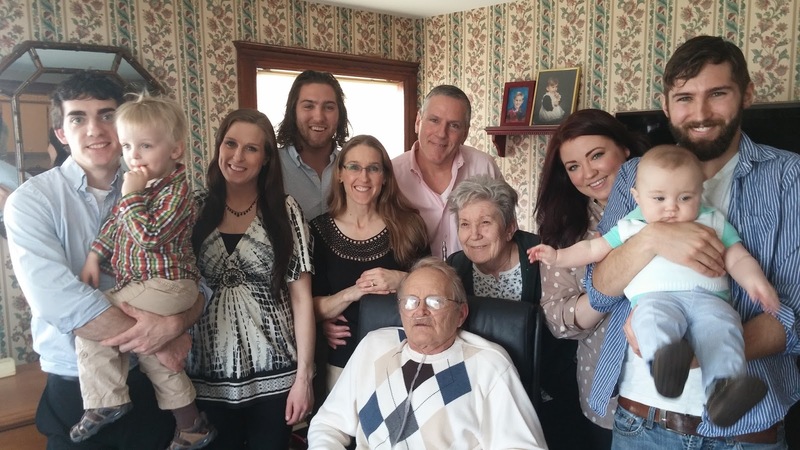 “It wasn’t until they learned of his end-stage emphysema that they changed,” Genevieve said. Genevieve said sometime in the night after his admission Bob suffered what the hospital vaguely told them was an “episode.” Things quickly began to go wrong from there. Bob's story highlights two growing problems that you need to be aware of. We intend to address these issues in the near future with two pieces of legislation. The first bill, Simon's Law, is inspired by a story and legislation out of Kansas. It would stop the heinous practice of secret DNR orders that override the wishes of patients or their parents. The second bill would deal with nearly unbelievable situations that we're hearing more and more of lately; doctors and hospitals have being going to court in secret to strip patients of their caregivers to withhold medical care. Families have shown up at the hospital to learn the hospital is suddenly now in charge of their loved one by court order. The second bill would prevent secret courts from overriding patient's wishes and restore a basic legal presumption that it is a patient's best interest to be alive. There are real situations where patient advocates can't let go and are no longer making decisions in the best interest of the patient. Those legal disputes must be approached fairly in court in the light of day—not in secret and in service to medical cost-cutting. What would Michigan look like if Planned Parenthood were in charge? The abortion industry in Michigan has a biennial custom of hosting a press conference promoting legislation that will never see the light of day. Yesterday this custom took place again, with another package of unpopular bills being introduced that have zero chance of passing. We don’t think the bills themselves deserve a lot of media attention because of their unpopularity and futile future. They do however offer an insight into how the abortion industry would like Michigan to operate if pro-abortion legislators held majorities in the Legislature. Let’s briefly touch on each bill they introduced. HB 4760 would eliminate the 24-hour waiting period before abortions. Waiting periods are broadly supported by the public. HB 4761 would repeal our Abortion Insurance Opt-Out Act, forcing Michigan taxpayers to fund abortions. The public broadly opposes tax-funded abortions. HB 4762 is extremely vague and mostly seems directed against our state’s law requiring informed consent before an abortion. The legislation in-part says that the state may not prohibit “a medical service that is evidence-based and appropriate for a patient.” Partial-birth abortions are cruel and barbaric—involving stabbing a baby in the head during the birth process—but the abortion industry argues it is effective and medically appropriate. Informed consent is broadly supported and partial-birth abortions are strongly opposed by most Americans. HB 4763 would formally legalize abortion past the point of viability in Michigan, up to the moment of birth. The bill would also allow Gosnell-style abortion clinics, striking down any state regulation that would force an abortion clinic to close, essentially banning health officials from any oversight. Late-term abortions are opposed by most Americans, and allowing the abortion industry to operate free of any medical oversight is dangerous. HB 4765 would force hospitals to perform abortions in Michigan. Recently pro-abortion groups have been trying to force Catholic medical facilities to provide abortions through the courts. Americans broadly reject forcing doctors and nurses to perform abortions. 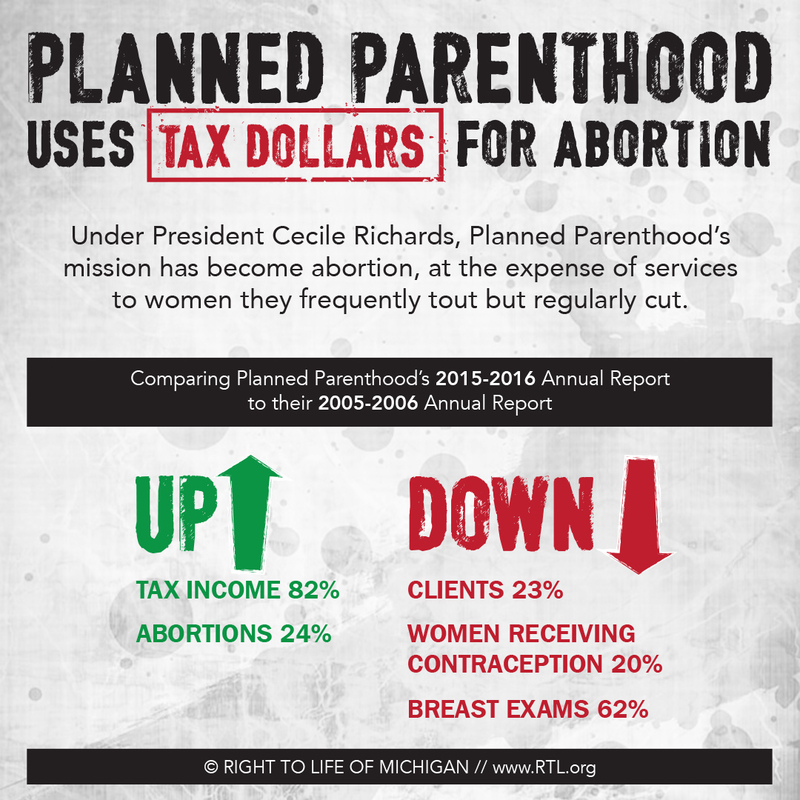 If Planned Parenthood ran the state of Michigan, abortions would be taxpayer-funded and legal right up to and including the process of birth. Women would be kept in the dark when it comes to informed consent about abortion. Abortion clinics would be uniquely exempt from any state health regulations. The many Catholic or other health care services and ministries in the state that object to taking innocent human life would be forced to close or participate directly in abortion. Michigan would become the wild west of the culture of death if these bills ever passed. The Kermit Gosnell case showed what happens when state officials look the other way as the abortion industry is left to regulate itself. Contrary to their public relations spin, Planned Parenthood is the nation’s largest provider and promoter of abortion. To read most reporting on Planned Parenthood, it is easy to believe the spin instead of facts. This was on full display when the media distracted people from the undercover videos showing them buying and selling babies’ body parts. Here's the facts that show why prolife people should not be forced to fund Planned Parenthood. Every year Gallup does a national poll on the issue of abortion, and this result is the same every year: a majority of Americans want all or most abortions to be illegal. Gallup's latest poll was released on June 9. Their annual polls haven't shown much change in recent years, but there are still a few patterns worth mentioning. This year Gallup reported that 54% of Americans want all or most abortions to be illegal. The stand-out number was just 29% of people thought that abortion should be legal in all circumstances. In 1973 abortion was legalized in all circumstances in the United States when unelected justices on the U.S. Supreme Court handed down Roe v. Wade and Doe v. Bolton. Only 29% of Americans agree with Roe v. Wade, allowing abortion-on-demand through all nine months of pregnancy. The flip-side of this is 68% of people are on a spectrum of either wanting abortion to be illegal in all cases or legal only under certain circumstances. Let's focus on that again: 68% of Americans say they want to alter our current abortion law. Confusingly Gallup polls show most Americans don't want to revisit Roe v. Wade, confirming what we've known for decades: most Americans don't understand Roe v. Wade and Doe v. Bolton. The media and our education system fails time and again in their responsibility of accurately explaining these two landmark cases. An increasing number of Americans say abortion is morally wrong, trending up to 49% from 45% in 2015. Those who think that abortion is morally acceptable is 43%, down from 45% in 2015. This trend is an encouraging indication that we are moving in the right direction with prolife messaging, especially considering the release of the videos highlighting Planned Parenthood's organ harvesting schemes. With continued education we can continue to win over the hearts and minds of people, keeping the current trend going. The Gallup poll also highlighted once again that there are few differences between how men and women view abortion. Slightly more men said they were prolife (48%) than women (43%). An interesting result is that 49% of women view abortion as morally wrong (48% of men agree), which doesn’t line up with 43% of women saying they are prolife. It's a long-standing problem that many people who believe that abortion is morally wrong and who would vote to ban most abortions often think of themselves as "pro-choice." While partisan elected officials have become increasingly divided over abortion, the actual voters in each party continue to show some variance. In the poll 61% of Republicans, 48% of Independents, and 26% of Democrats considered themselves "prolife." Those numbers should be highlighted more often, especially with the current Democratic National Committee Chair Tom Perez threatening to ban prolife Democrats from their own party. Contrary to predictions shortly after Roe v. Wade that Americans would come to know and love abortion, long-term trends show the prolife movement is gaining traction in public opinion. The last few years have showed little change, however, though the prolife movement has moved confidently to enact prolife policies at the state and national level. Even though prolife legislation often creates controversy, this controversy is not driving people away from the message than unborn children deserve to be valued as members of our human family. American’s ambivalence and confusion on abortion shows that we have more work to do as we further educate people on the realities of abortion. We know that the more people know about our issue, the more prolife they will become. Ambivalence and confusion sown by the abortion industry greatly helps their efforts. With 68% of American’s wanting to move away from the status quo of Roe v. Wade and 54% wanting to effectively ban most abortions, it is obvious that we have public opinion in our corner. Even after decades of repeated indoctrination from our media, culture and education system, the abortion industry can not convince most Americans to believe abortion is a positive good. No law in the U.S. Congress would ever be able to pass with just 29% of congressman voting for it. There is no reason that we should have a law that only 29% of people agree with; a law that voters or their representatives never enacted. Roe v. Wade is undeniably anti-democratic. Parental consent before an abortion is an important issue. Without parental consent laws young girls can go to an abortion clinic to have a life-changing procedure without a parent ever finding out. An overwhelming majority of voters support laws preventing minor teens from having secret abortions. The most recent Gallup poll on the issue found that 71 percent of people favored parental consent laws. While a member of the Michigan Legislature Debbie Stabenow voted against Michigan’s 1990 law requiring minors to have parental consent before abortion. Since 1990 minor children having abortions in Michigan dropped 79 percent. In 2013 in the U.S. Senate Debbie Stabenow voted against the Child Interstate Abortion Notification Act (CIANA). CIANA prevents people from smuggling children across state lines to circumvent a state's parental consent laws. You can't give an aspirin to a child at school without parental consent. A child can't get a tattoo without parental consent. Why would Senator Debbie Stabenow let children have secret abortions or let other adults take someone's child to another state to have a abortion? Here's your chance to get a Choose Life license plate! A bill to create a Choose Life license plate in Michigan is on the desk of Governor Rick Snyder. It's unclear if he will sign it or not. We hope Governor Snyder will realize the wonderful opportunity this plate offers to support pregnant women in need. That's where you come in! Legislation to create the Choose Life plate passed in a bipartisan 65 to 43 vote in the Michigan House on May 25. It first passed the Senate on April 28 by a 25 to 11 vote and received a final procedural vote on June 6. A Choose Life license plate would cost $35, with $10 paying for the cost of manufacturing the plate. The extra $25 in fees would go to a Choose Life Michigan fund. Grants from the fund will be given to specific projects to promote adoption and other alternatives to abortion, provide practical help to pregnant women, and suicide prevention programs. Michigan would become the 32nd state to offer a Choose Life license plate as an option to their citizens. Michigan would have the only Choose Life plate in the nation that also funds suicide prevention efforts. It’s time for Michigan to join every other state on the I-75 corridor down to Florida. 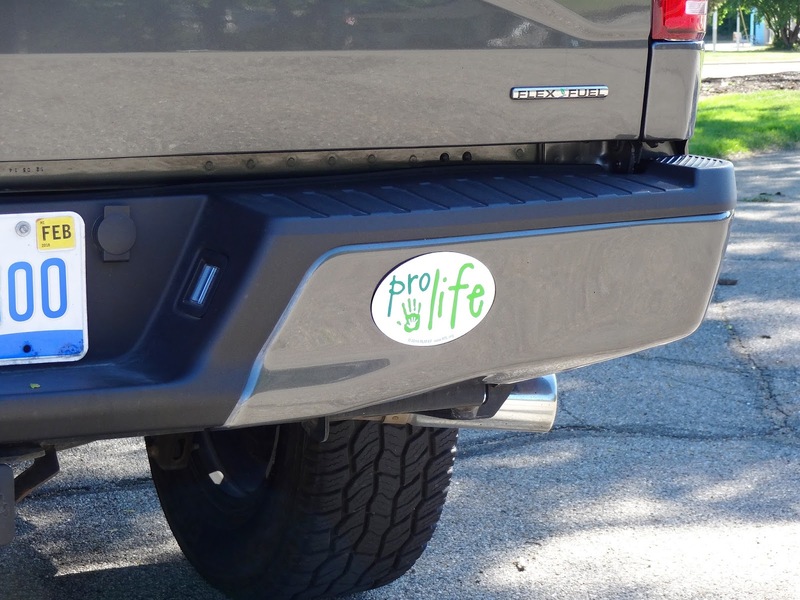 Many Michiganders see Choose Life plates while driving in other states and they want the same opportunity for us to increase support for pregnant women in need. Choose Life plates would first be available in 2018 if signed into law. The Secretary of State must approve the design of the new plate and then work through the manufacturing and distribution process, which takes approximately nine months. The plate design has not been finalized yet. Michigan law requires fundraising license plates to sell a minimum of 2,000 plates the first year, and 500 new plates each year for 5 additional years in order to continue offering the design. This is your opportunity to upgrade those bumper stickers to an official license plate that helps support women and men in need! Last week when being interviewed by Recode media, Planned Parenthood President Cecile Richards was asked about the impact social media has had on Planned Parenthood. She responded saying, "I think we were one of the original fake news targets." She continued by adding, "there’s a lot of bad information out there and efforts should be made to promote sources and information that are actually good." When asked to name an example of this "fake news" targeting, Richards declined, citing that she wanted to stay positive. Maybe this is because she knows that Planned Parenthood is really the one who relies on fake news as their public relations strategy. A good example is how they claim to provide mammograms when they really don't. You have been often warned about trusting the validity of particular statistics and Planned Parenthood is the perfect example of why. Most recently in their annual report, Planned Parenthood was able to keep their claim that abortions are just 3 percent of the services they offer. What they didn’t tell you was that they created additional "services" like "Other STI Prevention and Treatments" or "Other Contraceptive Services" to cook the books and cover up their increasing abortion numbers. We also must never forget the horribly gruesome undercover videos by the Center for Medical Progress. The most recent one featured an abortion doctor who was laughing about ripping out the eyes of unborn babies. We wish that was all fake news. Though Planned Parenthood has claimed time and again that these videos are "fake news," independent reviews of these videos have been done, there has been no evidence that has been found to discredit them. Even Planned Parenthood's phony self-review of the videos admitted they were genuine. Full footage of all of them is available online freely, but Planned Parenthood knows their supporters won't comb through hours of footage or transcripts like we have. So who is the real fake news here? Planned Parenthood has repeatedly shown that they are willing to lie about the services they provide so that they can continue to take our tax dollars. They claiming time and time again that they are working for women, when in reality they are cutting clients and health services in favor of abortion promotion. They frequently get away with this. When we post a story from a credited news agency about misdeeds in the abortion industry, we're the ones fighting off social media censors. Fake news and finding accurate sources of information is a real problem we all face. We have to truly stand up for all women and teach everyone the truth using good information, and not let Planned Parenthood distract them from their agenda of abortion-on-demand through all nine months of pregnancy.